Tuesday, August 22, 2017: On this day we had planned -besides in the evening celebrating our anniversay with a nice dinner – to ride our bicycles on (part of) the Platte River Parkway, and a convenient starting point was Fort Caspar, as it is located near one end of the trail and also has ample parking. Plus: starting there gave us the opportunity to visit the fort (first). Dienstag, 22. August 2017: Für diesen Tag hatten wir – einmal abgesehen davon, unseren Hochzeitstag mit einem schönen Abendessen zu feiern – geplant, mit unserer Rädern den Platte River Parkway – wenigstens zu einem Teil – zu radeln, und ein sehr passender Ausgangspunkt dafür war Fort Caspar, da es einerseits nahe eines der beiden Enden des Radwegs ist und andererseits über einen guten Parkplatz verfügt. Außerdem hatten wir so die Gelegenheit, (zuerst) das Fort zu besuchen. To begin with, a remark about spelling: we have found both “Casper” and “Caspar”. I don’t know why “Caspar” is preferred for the fort. Zuerst aber eine Bemerkung zur Schreibweise: es gibt Beides, “Casper” und “Caspar”. Warum man für das Fort die Schreibweise “Caspar” vorzieht? Keine Ahnung! This entry here is mainly pictures, but to start with, here’s some information about the fort: Fort Caspar, founded in 1859 on the south side of the North Platte River near the crossing – first by ferry and later by bridge – of the Emigrant Trail. 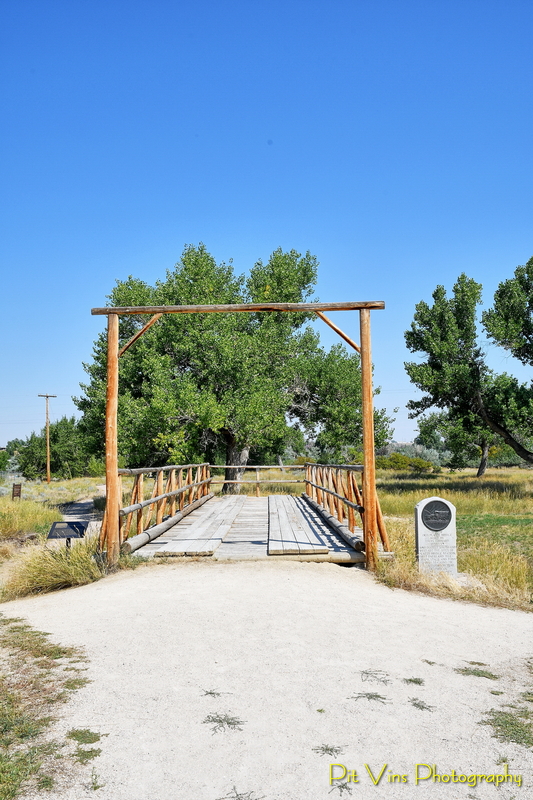 It was named after 2nd Lieutenant Caspar Collins, a U.S. Army officer who was killed in the 1865 Battle of the Platte Bridge Station against the Lakota and Cheyenne. The fort was abandoned in 1867. Dieser Blogeintrag hat hauptsächlich Bilder, aber dennoch zu Anfang ein paar Informationen zum Fort: Fort Caspar wurde 1859 gegründet und liegt am südlichen Ufer des North Platte River nahe der Stelle, an der der Emigrant Trail – zuerst per Fähre und später per Brücke – diesen Fluss überquerte. Benannt wurde es nach Leutnant 2. Grades Caspar Collins, einem Offizier der US-Armee, der 1865 im Gefecht der Battle Bridge Station gegen die Lakota und Cheyenne getötet wurde. Das Fort wurde 1867 aufgegeben. We also visited the museum – quite a bit of history of Casper itself, and the region, too – for a short time, and then went on our bicycle ride. But that’s another posting. Wir haben uns auch kurz das Museum – eine Menge zur Geschichte der Stadt Casper und der Gegend – angesehen, und dann ging es auf die Radtour. Aber die ist einen eigenen Beitrag wert. This entry was posted in Casper/WY, Casper/WY, cities, Day 4, Fort Caspar, pictures, sights, SolarEclipseRoadTrip, travelling, vacations and tagged Casper/WY, Fort Caspar, reisen, SolarEclipseRoadTrip. Bookmark the permalink. I can see you had a very interesting trip. We sure did. Only too short. We’d have liked at least another two days in Casper, e.g. For the Casper Railway Trail and to explore downtown Casper. But we enjoyed it. We saw quite a few new and great sights. The Fort looks like it could have been the location for Dances with Wolves. Beautiful photos of a gorgeous day. You’re right, come to think of it. That thought hadn’t occurred to me. The buidlings were fantastically well reconstructed. And yes, it was a gorgeous day. Perfect for bicycling, too. Neat! And good photos. This fort reminds me very much of a computer game, that I’d play with my younger sister when we were kids. It was called “Oregon Trail” and we loved it. At times, if your oxen hadn’t died and your character hadn’t succumbed to rattlesnakes, dysentery, or something, you’d arrive at a fort just like Caspar, and could buy additional supplies. We’d buy “saleratus,” bacon, bullets, etc. at the store, which looked just like your photo. Now that’s an interesting story, Robert. Thanks for sharing. I just checked: the Oregopn Trail did indeed go through Casper, from all I could see. I wish we had had more time to look around Fort Caspar, to really looks at details. That ferry seems less “ferry” to me than “raft”! Now that’s ever so true, Sarah! Gerne, liebe Martina! Freut mich immer, wenn meine Reiseberichte meinen Lesern gefallen. Great photos of Camp Caspar! Thanks for inside and out, so I can see it all. Meant to say Fort Caspar! Well, very likely all of it did start as a camp. Glad you like the pictures. I think the displays inside the block houses were great. I wish I had had the time to appreciate them more when we were there, and that I had been able to read [and possibly copy] some information about the buildings. Unfortunately we were in too much of a hurry because we wanted to do our bike ride still. Ja, es hatte schon eine echte Western-Atmosphaere dort, lieber Achim. Mich hat es – natuerlich – auch an Karl May erinnert. Waren es nicht die Gros Ventre Berge [wir waren nicht weit davon weg in Montana], wo Winnetou den Ton fuer sein Kalumet geholt hat? Und auf der Rueckfahrt kamen wir in die Naehe des Niobrara River [franzoesisch “Quicourt”], wo Winnetou ja bekanntlicherweise sich in Ribanna, die “Rose vom Quicourt”, verliebt hat. Da werden dann Jugenderinnerungen/-traeume wieder lebendig. Und ja: es war eine lange Reise! Knapp ueber 6000 Kilometer sind kein Pappenstiehl. Hat sich aber gelohnt. Das ist mir gänzlich entfallen. Die stehen hier im Buecherschrank. Habe sie mit in die USA genommen. Und ich habe sie auch als Kindle Ausgabe. Jetzt, da ich hier lebe, habe ich ein besonderes Interesse daran, zu sehen, wo die Handlungen denn genau spielen, und wie genau Karl May ueber die damalige USA Bescheid wusste. Ich dachte ja immer, der hat alles erfunden incl. den Llano Estacado, denkste lieber Herr Spengler 🙂 Halt mich da mal auf dem Laufenden, wie geographisch getreu der gute Mann da fabuliert hat. Nowadays they look so romantic, but I keep wondering how hard that life on the trecks must have been. Another place we missed! I’m glad you can show it all to me. That’s what blogging is good for: exchanging views of places! I can help you with the “Caspar” and “Casper” spellings. Fort Caspar had been built during the mid-19th century mass migration of land seekers along the Oregon, California and Mormon trails. In 1859, Louis Guinard built a bridge and trading post near the original ferry locations, and the government soon posted a military garrison, under the command of Lt. Col. William O. Collins, to protect telegraph and mail service. In July 1865, Lt. Caspar Collins, son of Col. Collins, was killed near the post by Indian warriors. Three months later the garrison was renamed Fort Caspar after Lt. Collins. In 1867, the troops were ordered to abandon Fort Caspar in favor of Fort Fetterman downstream on the North Platte along the Bozeman Trail. The town of Casper was founded in June 1888 by developers as an projected stopping point during the expansion of the Wyoming Central Railway. The town is named “Casper” instead of “Caspar” due to a typo that occurred when the town’s name was officially registered. Back then, of course, everything was handwritten, so it pays to write slowly and clearly.